The Statutes of Mortmain, 1279 and 1290 were initiated by Edward I of England to re-establish the prohibition against donation of land to the Church, originally proscribed by the Great Charter of 1217. The Statutes of Mortmain were two enactments, in 1279 and 1290, by Edward I of England aimed at preserving the kingdom's revenues by preventing land from passing into the possession of the Church. Possession of property by a corporation such as the church was known as mortmain. Mortmain literally means "the dead hand." In Medieval England, feudal estates generated taxes (in the form of incidents) upon the inheritance or granting of the estate. If an estate was owned by a religious corporation that never died, attained majority, or became attainted for treason, these taxes were never paid. The Statutes of Mortmain were meant to re-establish the prohibition against donating land to the Church for purposes of avoiding feudal services which had been hinted at in the Magna Carta in 1215 and specifically defined in the Great Charter of 1217. John of England died shortly after the Magna Carta was signed. Henry III of England, the son of John, did not enforce these proscriptions. He showed great deference to the Church. 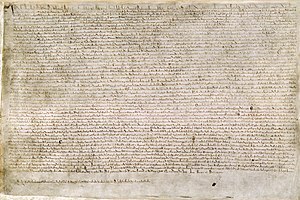 His son, Edward I of England, was interested in re-establishing the precedent set in the Magna Carta and the Great Charter of 1217. The Statutes of Mortmain provided that no estate should be granted to a corporation without royal assent. The problem of Church lands persisted with the practice of cestui que use. It was finally brought to a close when Henry VIII of England disbanded the monasteries and confiscated Church lands. In England in the 12th and 13th Centuries, the legal ownership of land was defined through a hierarchical system of estates. The monarch was the ultimate owner of all land in the realm, and out of his estate lesser estates existed, held by individuals known as tenants in capite. Further estates could be created out of these estates in a process called subinfeudation. Estates in land could be alienated (that is, their title could be transferred to others) in two ways. Substitution meant that the purchaser would take the estate with the same tenures and held from the same lord as the original tenant. Subinfeudation meant that the original tenant continued to hold an estate, but that a new estate would be created held of the original tenant and subsidiary to the original estate. Alienation was not always possible, and sometimes the permission of the lord was required. It is the opinion of Pollock and Maitland that in the middle of the 13th century the tenant enjoyed a large power of disposing of his tenement by act inter vivos, though this was subject to some restraints in favor of his lord. Other opinions have been expressed. Coke regarded the English tradition as one of ancient liberty dictated by custom. The tenant had relative freedom to alienate all or part of his estate. Blackstone was of a differing conclusion. The “learning of feuds” started with the inalienability of the fief as a starting point. Pollock and Maitland believe Coke’s opinion to be the more valid one. Both views may have been true. Modern scholars may have given more weight to the written and declared law of the Normans than existed in reality. A consequence of the ability for owners to alienate their estates was a growth in gifts of land to the church. Estates so given were said to be in frankalmoin tenure. When estates were subinfeudated, it was detrimental to the overlord's rights. It was difficult or impossible for the overlord to extract any services (such as knight service, rent, homage ) from the new tenants, as they had no bond to the overlord. Pollock and Maitland give the following example: In the case of subinfeudation, the old tenant was liable for services to the lord. If A enfoeffed to B to hold a knight's service, and then B enfoeffed C to hold as a rent of a pound of pepper per year; B dies leaving an heir within age; A is entitled to a wardship; but it will be worth very little: instead of being entitled to enjoy the land itself until the heir is of age, he will get a few annual pounds of pepper. Instead of enjoying the land by escheat, he will only receive a trifling rent. Bracton gives the example of when the tenant made a gift of frankalmoin - a gift of land to the Church. A wardship would be of no value at all. An escheat of the land (a reclamation of the land by the overlord) would allow the owner to take control of the land. But the act of placing the land in frankalmoin left it in the hands of a group of lawyers or others who allowed the use of the land by a Church organization. The overlord would have nominal control of the corporation which had never entered into a feudal homage arrangement. The corporation owed nothing to the overlord. Bracton was sympathetic to this arrangement. According to him the lord is not really injured. His rights to the land remain unscathed. It is true they have been significantly diminished. He had suffered damnum, but there had been no iniuria. Bracton was of the opinion that a gift of land to the Church could be voided by the heirs, but not the lord. The statute of Quia Emptores, enacted in 1290, confirmed the ability of tenants to freely alienate their estates by substitution, and ended the possibility of alienation by subinfeudation. It also ended the possibility for further estates in frankalmoin to be created by anyone other than the king. Buckfast Abbey as rebuilt. It originated on land donated in by King Cnut in 1018, and became a Cistertian abbey in 1147. Gifts of land in frankalmoin were intended to be made to God. Bracton describes these as "primo et principaliter" to God, and only "secundario" to the canons or monks or parsons. A gift, for example, to Ramsey Abbey would take the form of a gift “to God and St. Benet of Ramsey and the Abbot Walter and the monks of St. Benet”; or in shorthand, “to God and the church of St. Benet of Ramsey” or briefly “to God and St. Benet”. Often the donor laid the charter of feoffment or some other symbol such as a knife or other symbol of possession upon the altar of the church. God was considered the primary landowner. Bracton founds several arguments upon this assertion. It suggested land given in frankalmoin was outside the sphere of mere human justice. In later years, the feature of tenure of frankalmoin which attracted the notice of lawyers was the absence of any service that could be enforced by the secular courts. Grants from the Crown “in free, pure and perpetual alms” would be free from all secular service. However, if a mesne lord was involved, then services such as socage, fee and other services might be extracted from the land, either in part or in total. Cases became so complicated that a special assize, the Assize of Utrum was established in the middle of the 12th century. Jurisdiction would normally lie in the ecclesiastic courts. The Assize of Utrum, especially as defined in the Constitutions of Clarendon, 1164, gave the Crown a chance to clarify difficult questions of ownership and duty in a non-religious, secular court. Often, ownership was of less importance than in determining who had rights to grain, knight service, marriage penalties and the like. These duties were defined in the manner in which the land had been granted, and by whom in the feudal chain. Frequently land would be donated to a church organization and re-let to the grantor to avoid feudal services to the great lord. Henry III of England gave great deference to the Church and did not enforce the proscriptions against mortmain defined in the Great Charters of 1215 and 1217. Magna Carta 1215 hinted at the alienation of land to the Church for the purpose of avoiding feudal incidents. The Great Charter of 1217 forbade the practice outright. Leaving land to the Church had a long and contentious history in England. Prior to the Norman Invasion the state and Church were frequently mixed. The local bishop or priest might also sit in judgment of civil and criminal cases. The Normans created a strict separation of Church and state. William the Conqueror encouraged the separation, but was enthusiastic about the role the Church played in moral matters. As a result, a two-tiered legal system developed: The ecclesiastic courts and the Common Law courts. Jurisdiction was frequently blurred. One not receiving a satisfactory result in one court could re-file the case in another. Writs of prohibition were frequently issued by Common Law courts to bar filing the case in a Church court. Bracton considered it a sin for a person to pledge to live by the result of a Common Law court, only to file it in a Church court. The practice of pledging land to the Church was generally covered under the laws of frankalmoin after the Normans. There were two reasons to do so: gratitude toward the Church and to avoid feudal constraints and duties. Once land had been pledged to the Church, it was difficult or impossible for the lord to extract his duties from the land. Bracton considered the case of when a tenant made a gift of frankalmoin – a gift of land to the Church. A wardship would be of no value at all. An escheat of the land (a reclamation of the land by the overlord) would allow the owner to take control of the land. But the act of placing the land in frankalmoin left it in the hands of a group of lawyers or others who allowed the use of the land by a Church organization. The overlord would have nominal control of the corporation which had never entered into a feudal homage arrangement. The corporation owed nothing to the overlord. Bracton was sympathetic to this arrangement. According to him the lord is not really injured. His rights to the land remain unscathed. It is true they have been significantly diminished. He had [suffered damnum, but there had been no iniuria (damnum absque injuria). Bracton was of the opinion that a gift of land to the Church could be voided by the heirs, but not the lord. Once the land came into the control of the Church, it could never be relinquished. Since the Church never died, the land could never be inherited or escheated to the lord. This came to be known as the “dead hand” (mortmain). Either the Church was the dead hand, or the hand of the dead still controlled land by willing it to the Church. The actions of people who had died generations before still controlled the land. This was also the “dead hand”. The great Charter of 1217 had struck at certain collusive practices to which the churches were privy. Collusive gifts to the Church (which were frequently made in order to evade feudal service) were forbidden. Coke interprets this as though its only effect was to make the excessive gift voidable by the donor’s heir. It certainly could not be voided by the donor’s lord, and this opinion was reiterated by Bracton. Chapter 43: “One is not to enfoeff a religious house and take back the land as a tenant of that house.” The mischief to be prevented seems to be this: some favoured religious bodies, e.g. the Templars, have royal charters which by general words set free all the lands that they now have, or shall hereafter acquire, from many burdens. A man gives land to such a house and then becomes that house’s tenant, and as such he claims immunity under the charter. The granting of land to a religious body freed the tenant from his duties to the lord and owner of the land. The Charter of 1217 left no provision for granting land to the Church. In spite of this, Henry III lavishly granted licenses (which were not authorized by statute). In 1258 at the Oxford Parliament the barons sought to preclude men of religion from entering into the fees of earls and barons and others without their will, whereby they lost forever their wardships, marriages, reliefs and escheats. In 1259 the Provisions of Westminster ordained that it shall not be lawful for men of religion to enter the fee of anyone without the license of the lord of whom the land is held. The provisions were first considered law, then not rigorously enforced depending on who had political sway: barons or king. Most of the provisions in Westminster were re-enacted by the Statute of Marlborough in 1267, but not the ones mentioned. From this it may be gathered that the clergy had been influential with the king who was enjoying power over the barons. The Statute of Marlborough had been the nominal endpoint of the Second Barons' War. The omission of restrictions on the Church can be directly traced to Henry III and his sympathy to the clergy, according to Plucknett. In 1279 the Statute De Viris Religiosis referred to the Provisions of Westminster as if they had been settled law, added a check on alienations made in mortmain. No religious persons were to acquire land. If they did, the land was forfeited to the lord, and he had a brief term given for him to take advantage of the forfeiture. If he failed to do so, the lord next above him in the feudal scale had a similar opportunity. This continued up to the king. The statute did not merely condemn frankalmoin; the religious are not to acquire more land, even though they are willing to pay a full rent for it. If the lord was willing, the land could be granted to the religious body by his inaction. Licenses to acquire land in mortmain were easily obtained in those years. King Henry III was sympathetic to religious bodies during his long reign. There had been a parallel French ordinance enacted in 1275. Henry III had a reputation of ruling by fiat – making royal proclamations on the spur of the moment. These were troublesome to both the secular and church courts of the day. Efforts were made to curtail and limit his practice. The ruins of Hailes Abbey established about 1245 by Richard, Earl of Cornwall, the younger brother of Henry III of England. Several cases recorded where the King specifically forbade the tenant from alienating a church or land held in perpetuity by the Crown, and presumably the equivalent of mortmain. These cases are dated 1164, 1221 and 1227. After 1217, there was a forfeiture of land to the great lord in cases of unauthorized alienation in mortmain. Henry III granted conspicuous favour to the Church and left the proclamations of 1215-1217 largely unenforced. The proscription was reintroduced and made more forcible by Henry III’s son, Edward I in the Statute of Mortmain in 1279. It was not effective. Land could be still be left to the Church by the mechanism of cestui que use. Henry VII of England expended much energy in the courts trying to break the legal grip of "uses" by Church corporations. The Statute of Uses three centuries after the Statutes of Mortmain would attempt, with only partial success to end the practice of cestui que use. Henry VIII of England would resolve the problem once and for all by disbanding the monasteries and confiscating all church land. ^ Pollock and Maitland, Vol 1, p. 329, ibid. ^ P & M, p. 129 ibid. ^ Pollock and Maitland, p. 330-331, ibid. ^ P & M vol 1 p. 243-244 ibid. ^ Bracton f. 12, 286 b. ^ Plucknett, p. 24, ibid. ^ P & M, Vol . 1 p. 332, ibid. ^ P. & M. Vol. 1 p. 333, ibid. ^ Plucknett, p. 541-542, ibid. ^ P. & M. p. 334, ibid. ^ Pluckett, p. 541, ibid. ^ Le regne de Phillippe le Hardi, 206 ff. ^ Plucknett, p. 541 ibid. This page was last edited on 28 January 2019, at 14:00 (UTC).